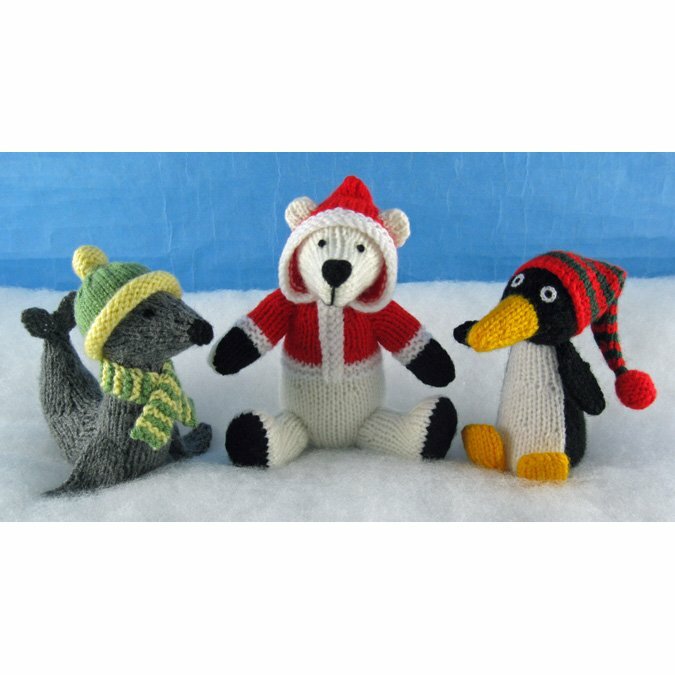 Measurements: The seal is 4½in (11.5cm) tall, 5in (12.5cm) long, the polar bear is 6in (15cm) tall, and the penguin is 4½in (11.5cm) tall. You will need for the Seal: Of Hayfield Bonus DK, 100g balls: 14g in Dark Grey Mix 790, 4g each in Primrose 957 and Grass 825, and 1g in Black 965; 20g of washable toy stuffing. For the Polar Bear: Of Hayfield Bonus DK, 100g balls: 14g in Cream 812, 8g in Signal Red 977, and 4g each in White 961 and Black 965; 25g of washable toy stuffing. For the Penguin: Of Hayfield Bonus DK, 100g balls: 10g in Black 965, 2g each in White 961 and Bottle Green 839, 3g in Signal Red 977 and 4g in Sunflower 978; 15g of washable toy stuffing. You will also need: Pair of 3mm (no.11) knitting needles; long tweezers.